July 1: Mark Chubb starts us off this week with "Concept vs Procedure: An anecdote about what it means to be good at math." I highly recommend this post, and am reminded that the entirety of the learning experiences and assessment opportunities we design for students matter, not just the formal demonstrations of formalized algorithms. July 2: This October 2015 article from Eric Westervelt on the KQED Mindshift blog describes "How Adding Math to a Child's Home Routine Can Advance Achievement." July 3: From the Farnam Street blog, people (re)shared "Richard Feynman on Teaching Math to Kids and the Lessons of Knowledge." A post like this makes me glad the standard for mathematical practice is "attend to precision," not "be (a certain kind of) precise." Feynman had some good examples where curriculum materials in math and science stressed certain points or used certain language in the name of precision, but arguably did little to further student understanding. 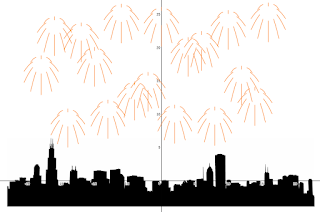 July 4: It's a holiday in the U.S. You bring the math, and let Desmos set off...Fireworks! 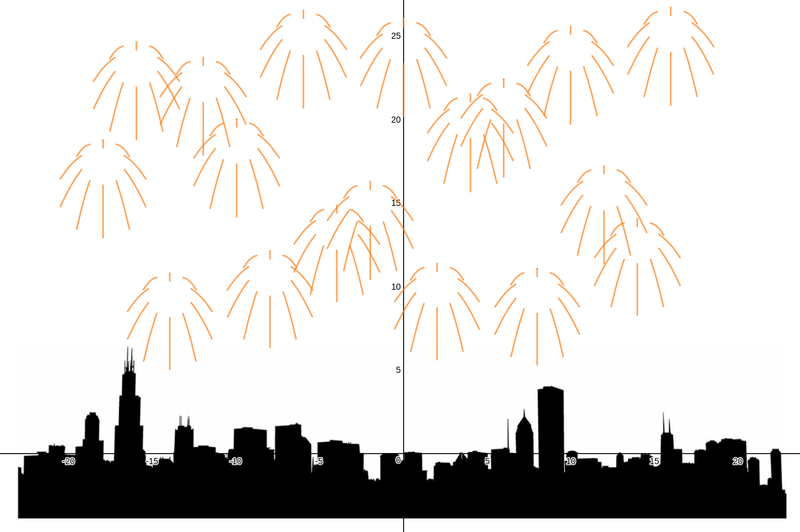 July 5: The title of this post speaks for itself: "Math, Desmos, and Artglass Windows." It's great to see some uses of Desmos beyond the classroom. July 6: Dan Meyer has a new blog series going, the latest of which is the post "Who Wore It Best: Maximizing Area." Two things I really, really like here: (1) I get to see three math ed technologies used side-by-side, which helps me understand the capabilities of each, and (2) Dan is putting the math first, and letting technology serve the math. That's hard to do with technology, as products are often presented as solutions in search of a problem. July 7: Rafranz Davis wrote, "Another Night, Another Shooting," in the wake of yet more shootings of black Americans by the police. The Global Math Department is taking a summer break and I'm not hearing much else other than people preparing for TMC. Let me know if I'm missing something! The August 2016 issue of ZDM has the focus, "Survey on research on mathematics education." Comment: The last of the above articles, written by Ben Christopher and originally appearing on Priceonomics, is probably the single best take I've seen on the issue of accelerating students through (or past) middle school mathematics classes. In particular, this article makes it clear that 8th grade math, as described by the 8th grade standards, largely is what parents remember as "Algebra 1" from when they were in school. SFUSD's work with the SERP Institute and mathematics course pathways comes through loud and clear here, and I look forward to seeing new data come in as fewer students are skipping through the curriculum on a rush to Algebra 1 and beyond. Mark your calendars for next year's Math on the "Planes" conference, presented by the Colorado Council for Learning Disabilities. The conference is February 24 and 25, 2017, at the Student Achievement Resource Center (SARC) in Centennial. You can download a flyer here. NEW: There's an opening at Englewood High School and they're hoping to interview as soon as next week! If you are interested, contact Beth Hankle at beth_hankle@engschools.net for more information. Roaring Fork Schools (Re-1) is seeking a dynamic and engaging, full-time alternative math teacher for Bridges High in Carbondale. This is an immediate hire to start in August for SY 2016-17. Roaring Fork Schools is 2.5 hours from Denver, has a world-class hot springs, and recently passed a $122 million bond issue. Apply here and contact Nate Adams if you have questions. NEW: Prospect Ridge Academy in Broomfield is actively seeking an additional HS Math teacher due increased enrollment and the addition of sections. We are a college prep, math/science focus school with exciting growth potential. The position is currently a 0.6 (3 section) part time HS math position with the possibility of adding middle school math intervention and additional responsibilities to make the position full time if needed. Apply here. A secondary math instructional coach is needed at Prairie Heights Middle School in Greeley. Email Vida Trevino for more information, or go here to apply. Platte Canyon in Bailey needs someone to teach Algebra 1 through Precalculus. Apply at www.plattecanyonschools.org.